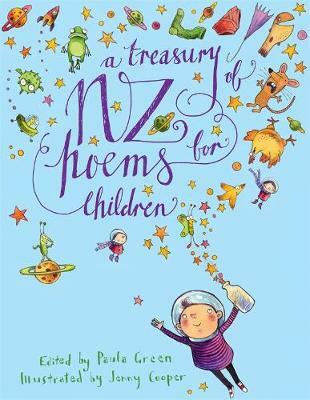 An award-winning collection of the best New Zealand poems for children, edited by star New Zealand poet Paula Green and illustrated inventively by Jenny Cooper.Winner of a Storylines Notable Non-Fiction Award 2015This exciting collection is truly a must-have for every home, school and library. Bursting with wonderful poems that will make you laugh, cry, nod and ponder, this book is beautifully illustrated and makes a perfect gift book. Paula Green (Author) Paula Green is one of New Zealand's most highly regarded poets, having published a number of poetry collections of her own for both adults and children and edited several anthologies. With Harry Ricketts she wrote the critically acclaimed 99 Ways into New Zealand Poetry (2010), which was shortlisted for the NZ Post Book Awards 2011. She lives in west Auckland with her husband, the painter Michael Hight, and two daughters. The Otago Daily Times wrote of her poetry collection The Baker's Thumbprint, 'There is a glowing, throbbing beauty in this one. This little book seems to pulse with warmth and sense of calm, comfort and joy. Green this time around has blown open the doors and taken an endless rainbow of excitement and imagination. All the way through you think, Wow, wonder what's coming next? Green once said There is a magical reaction between something I see, hear, experience, feel or remember and the words in my head. In that magical moment, I find the seeds of a poem. And it is of course completely unpredictable. The Baker's Thumbprint is neat. Jenny Cooper (Illustrator) Jenny Cooper is an award-winning and prolific illustrator of more than 70 children's books, and says she finds each new title completely different and a new adventure . Noted for being an exceptionally versatile, characterful and exuberant illustrator, the judges of the 2015 LIANZA Children and Young Adult Book Awards praised Jenny for the multitude of talents in her basket of goodies . . . she is able to draw a variety of animals convincingly well; her command of emotional drawing is also superb. The depth of feeling in the faces of her characters brings tears to the reader's eyes. She is surely envied by other illustrators. Jenny's recent work includes a series of critically acclaimed First World War picture books with text by Glyn Harper - Roly, the Anzac Donkey, Jim's Letters and Le Quesnoy- The Story of the Town New Zealand Saved - and the beautiful A Treasury of New Zealand Poems for Children edited by Paula Green. In 2015 Jenny was honoured as one of New Zealand's foremost illustrators with the presentation of The Arts Foundation Mallinson Rendel Illustrators Award. The award's patron Ann Mallinson declared her the perfect recipient , saying that Whether a pencil sketch or a realistic, photographic based style, Jenny's illustrations jump out of the page with an invigorating spirit . . . Jenny is a greatly admired and very experienced artist who has illustrated a large number of picture books. Her work is always of the highest standard. She can tackle any subject, and if it requires more than her wonderful imagination, she will do thorough research. In August 2015 Jim's Letters, Jenny's and author Glyn Harper's memorable depiction of a World War One correspondence between two brothers, one a soldier in Gallipoli and the other at home on their Central Otago farm, won the Picture Book category of the New Zealand Book Awards for Children and Young Adults. Jenny has also won a number of Storylines Notable Book Awards - for A Treasury of New Zealand Poems for Children edited by Paula Green (2015); Jim's Letters with Glyn Harper (2015); Ria the Reckless Wrybill with Jane Buxton (2011); A. W. Reed's classic Illustrated Myths and Legends of the Pacific (2008); The Mad Tadpole Adventure with Melanie Drewery (2008); Duck Walk with Joy Cowley (2003); The Great Pavlova Cover-up edited by Jo Noble (2002); and The Wooden Fish with Tim Tipene (2000). Jenny lives in Amberley, near Christchurch.